Following last Sunday’s post covering the first part of my walk around London’s West End theatres, I had been expecting to publish the second part a couple of days ago, however I must admit I have never really counted up how many theatres there are (over 40), so I am still working on the post. Therefore today, back to one of my father’s photos of London 70 years ago. The magnificent framework of the original glass roof of Cannon Street Station is in the rear of the photo, the glass had previously been removed so this is just the metal framework. My father was standing on London Bridge to take the photo and the river front consists of space cleared of buildings damaged by wartime bombing and some of the remaining warehouse and wharf buildings. I took a wider photo of the scene today to set the context as the side walls of Cannon Street Station are now obscured and the station has long since lost the original roof. The scene has completely changed, and the perspective of the two photos looks different due to very different lens and camera types, however there are some features remaining that allow the buildings in the original photo to be located. The following map extract is from the 1952 Ordnance Survey map of the area (published in 1952, surveyed the previous year). In the map, Cannon Street Station is the large building, partly shown on the left of the map. The first feature to identify on the photo is Old Swan Pier. In the map, this can be seen running from a small, rectangular indentation in the river wall. In the original photo, this is the metal walkway that can just be seen running out from the river wall, with the small indentation in the river wall also partly visible. This allows the building to be identified adjacent to the pier, this is Swan Wharf, the building has a date on the very top which I can just make out as either 1896 or 1894. Now follow the river wall from the pier and Swan Wharf back to the right hand edge of the photo and the river wall steps back twice, once alongside the edge of the Swan Wharf building, and the second slightly further along. 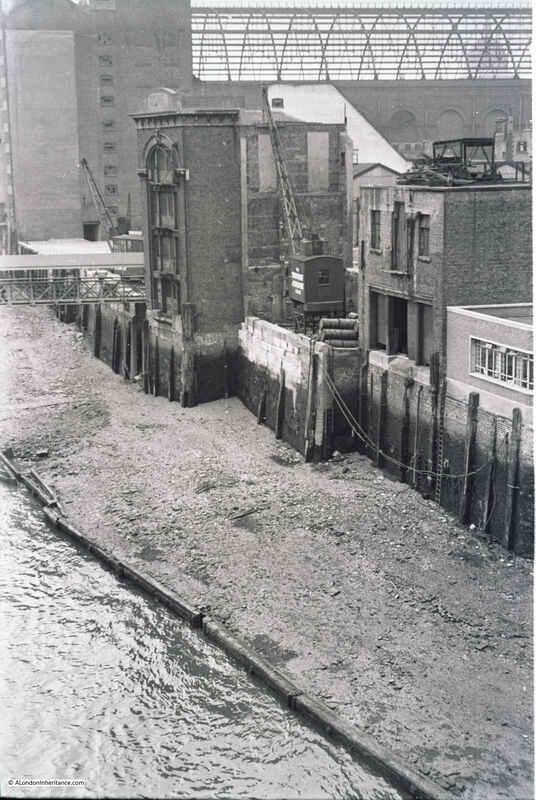 These two steps backs in the river wall can also be seen in the 1952 map which identifies the building to the right of the crane as the building at the end of Old Swan Wharf in the map. The definition of the original film is not sufficient to clearly read the white writing on the side of the crane, but it appears to read “The Swan Wharf & ———“. I cannot make out the last word. Given the level of redevelopment in this area it would be surprising if any of these features (apart from the station) remain, however there are some that allow the location of the original buildings to be placed along the river’s edge today. Firstly, look along the river wall in today’s photo and you will see an indention in the river wall. This is the same indentation as at the location of the pier in the original photo and was retained as this gap in the river wall is the location of Old Swan Stairs, one of the many historic stairs leading down to the river. Two dolphin structures can also be seen in the river, these are a couple of the remaining supports from the Old Swan Pier. To the right of the stairs in today’s photo is a large tree, this is the location of the Swan Wharf building in the original photo. From the tree to the right of today’s photo there are two step backs in the river wall. These are the same as those in the post war photo, with the old building to the right of the crane being the building at the end of Old Swan Wharfe in the 1952 map. Old Swan Stairs have been here for many centuries. 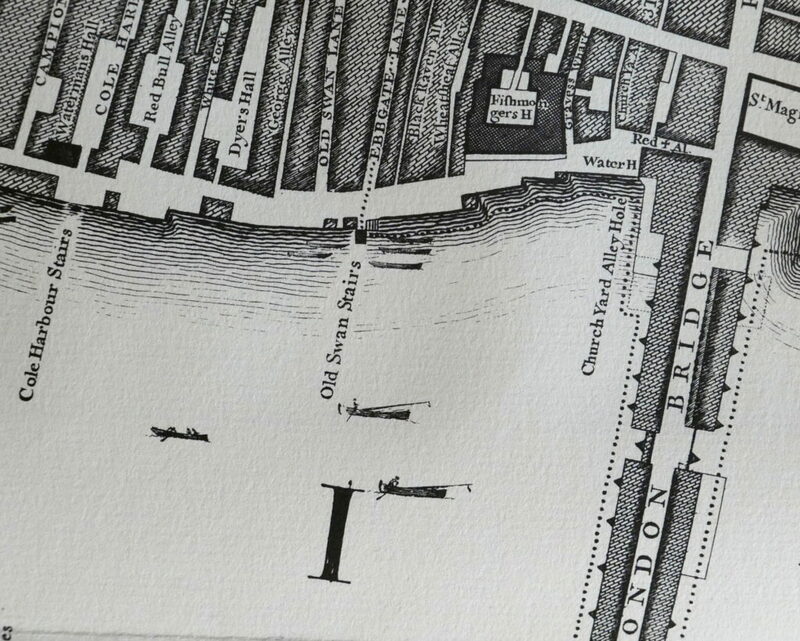 The following extract from John Rocque’s map of 1746 shows Old Swan Stairs. 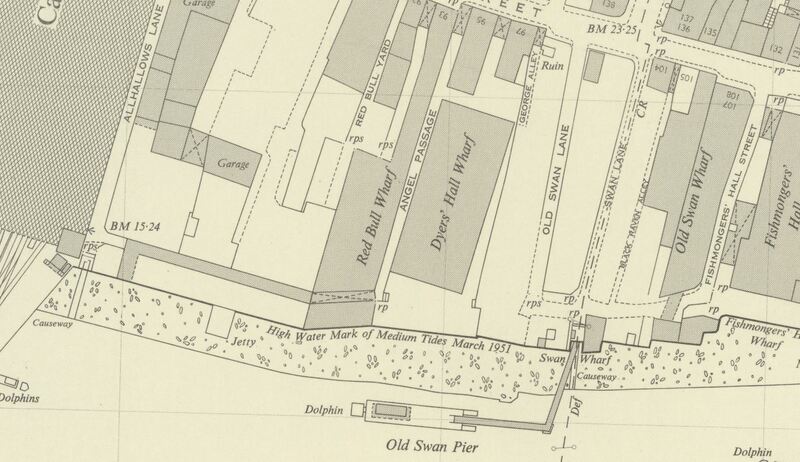 In the 1746 map, the stairs are at the end of Ebbgate Lane, in the 1952 map this lane was then Swan Lane with Old Swan Lane to the left in both maps. Swan Stairs were mentioned in the diaries of Samuel Pepys and in Stow’s 1603 Survey of London there is a mention Old Swan: “This ward turneth into Thames streete westwarde, some ten houses on a side to the course of the Walbrooke, but East in Thames streets on both sides to Ebgate lane, or old Swan.” in his description of the boundaries of Downegate (Dowgate) Ward. Old Swan Stairs were also the starting point for the Swan Upping ceremony when it started in central London. 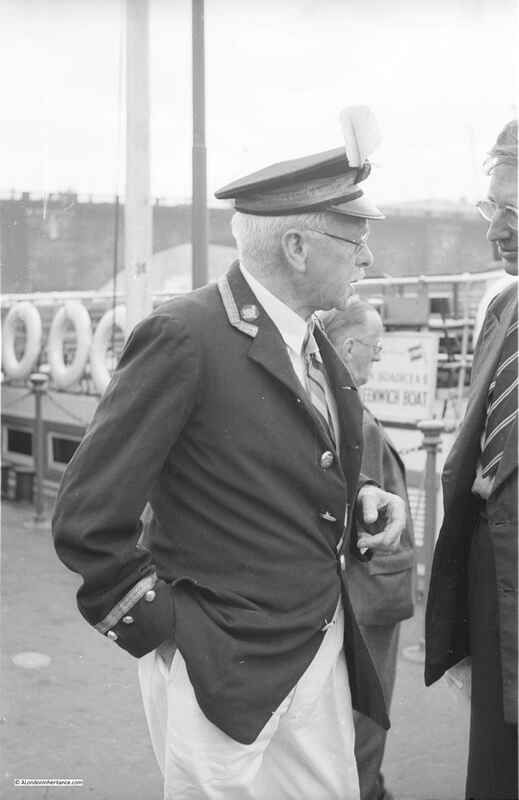 My father took some photos of Swan Upping starting around Old Swan Stairs and in the following photo is Mr Richard Turk who was the Vintners Swan Marker and Barge Master, with the Old Swan Pier in the background. The sign on the right of the piers indicates that boats to Greenwich could be boarded here. My full post on Swan Upping can be found here. To Richmond – Daily at half-past 9, calling at Hungerford at 10 o’clock, and to Twickenham every Monday, Wednesday and Friday. Week days 1s 6d; on Sundays 2s. There are frequent mentions of Old Swan Stairs in newspaper reports since the early 18th century, and they describe the life and tragedies that must have been day to day experiences along this stretch of the Thames. “Sunday Morning a young Man, dressed in a Sailor’s Jacket with Trowsers and a speckled Shirt was found in the Mud near the Old Swan Stairs; his Buckles, which were supposed to be Silver, were taken out of his Shoes. He was carried into the Church-yard, near the Stairs, till own’d, or a Warrant granted for his Burial”. The implications being that either he was murdered for the silver shoe buckles, or he had died accidentally and his shoe buckles had been stolen. Standing at Old Swan Stairs would have provided a fascinating view across to what would later be Southwark Cathedral with London Bridge to the left. 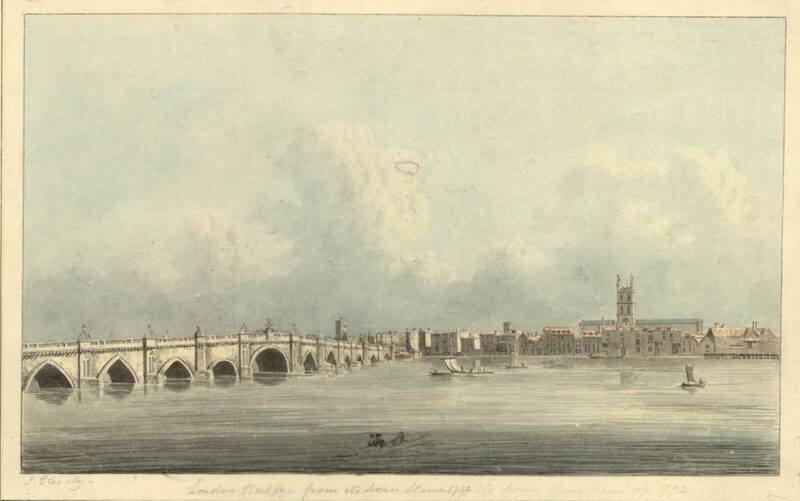 John Cleverly made the following drawing (©Trustees of the British Museum) of the view from Old Swan Stairs in 1792. Despite the land along the river having changed so dramatically over the last 70 years, we can still find features that date back hundreds of years and allow us to accurately place events from centuries of London’s history. This entry was posted in The Thames and tagged Cannon Street Station, London Bridge, Old Swan Stairs on June 11, 2017 by admin. I think the wording on the crane is probably “THE SWAN WHARF & TRANSPORT CO. LTD.”, spread over four lines. A search of The Times archive throws up several mentions of that company in the 1940s and 1950s. According to the London Gazette the company was wound up in 1962. Other word on the crane is “Transport” I think. Fascinating post – thank you. On the evidence of his attire, I suspect the involvement of spirituous liquors. Fascinating photo – you can see how much the foreshore has eroded since my father took the original photo. As a traveller who loves London, I find your before and after posts very much of interest. Keep it up. Well done. Just watching “Escape Route” c1952 with George Raft and 1hr 15 mins in, he is running around this area of London. The street signs are clear to see! I was very pleased to have found your site when I googled “Old Swan Stairs”. My 7 x great grandfather was listed in the Baldwin’s directory as a wharfinger, living at 11 Old Swan Stairs from 1751-75. So it’s been great to see your father’s old photograph and the old maps, and read the history of the area. As a background a few years ago I bought a second hand book called London Night which has a very nice set of night photographs of London circa 1937. As I live in Australia and have a keen interest in photography along with a planned trip to London etc in September this year I was exploring the possibility of replicating as much of the original book as was possible in the short time I will have in London. Black Raven Alley is one of the subject in the original book and I have been trying to locate it for a couple of months (on and off). With great delight on finding your blog I for the first time have seen a map that shows its location. Now if the dream or replicating the book becomes a reality I know where Black Raven Alley used to be. There are a few other streets that are proving to be difficult to locate exactly, including one in Brompton that starts with M called a cul de sac in the book. John, your cul-de-sac off Brompton Road looks like the corner of Rutland Street and (now renamed) Fairholt Street. A lot has changed there but there are sufficient clues to make this a match. The rounded end of the dairy building; the two-storey houses on the left with a low brick walls from pavement to front gardens, the slight incline to Rutland Street, the angles of the street junction. If our host will permit it, here’s a link to the 1934 photo: https://didoisux.wordpress.com/tag/grange-street/ and scroll down to “Cul-de-sac, Brompton Road”. A 1936 Ordnance Survey map gives the “M” of the street sign as Middle Street. If you use Google Streetview then you’ll need to check the various editions of its images to see the former dairy building and the high brick wall at the end of the cul-de-sac. Because of successive construction works getting in the way there isn’t one Streetview image that shows everything. That was fun to locate! Thank you for your helpful information, I have had a look on google street view and Fairholt street is definitely the one. Thank you very much. You would happen to know where the second photo losely called a street in the city was?? Bit of an ask I know. Anyway thank you for the info on Fairholt. Yes “a bit of an ask” with very few clues to go on. But it’s not no clues at all. We have a nameless pub on a street corner, and the street corner subtends more than ninety degrees. The pub building appears to have a rounded corner. There is little or no incline to the side street, and it is indeed a side street, not a major thoroughfare. The foreground street appears to have a modest slope downwards from right to left so perhaps that indicates the direction of the Thames. At the risk of incurring the wrath of our kind and patient host and in the furtherance of London history studies, I suggest an examination of this NLS map: http://maps.nls.uk/geo/explore/#zoom=18&lat=51.5089&lon=-0.0818&layers=163&b=1 and its neighbours to the north and west. On that map a pub (P.H.) on the corner of Lower Thames Street and Water Lane fits some of those parameters but not all of them. Water Lane would have had an unmissable incline to it as shown by the B.M. heights on the map. So we get the idea of how to dismiss impossibles by checking such details. By the way that same map allows us to pinpoint the spot from which the “London Night” Black Raven Alley photo was taken. I’m grateful to our host and to John for giving the opportunity to chance upon that. Thank you for you help and a big thank you to our host for not kicking us off. I have managed to find, I think, another obscure location briefly described as “The Dark House” Riverside, East End. I believe it is Ludgate Square, The Windows and possible a round building on the right still exist and look remakably like the original photo. Most of the rest has changed though. Of course this is meaningless if you don’t have the book and I don’t really want to post a photo on our hosts site. I have searched high and low and the only place I can find that even closely resembles the photo in question is the Anchor Pub Bankside London. There are several old photos kicking around that shows the bollards leaning etc. However the the buildings around the corner don’t fit. Still this is my best ft. Any thoughts?. Likewise John, I have reached a cul-de-sac. 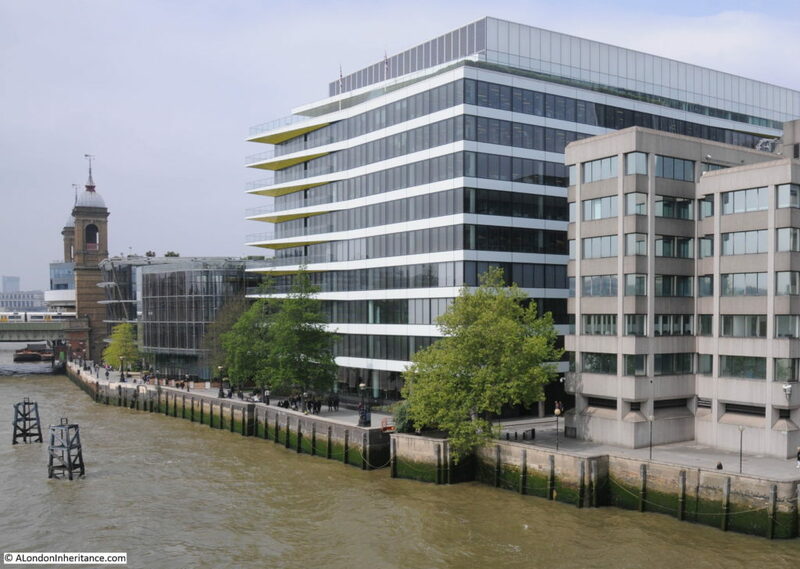 But congrats on spotting the similarities with the Anchor at Bankside. You have probably come across this print: “BANKSIDE. The Anchor Tavern, by E. B. Musman 1947” – a web search will find it but also dismisses it as a location if you had any lingering hopes there. Careful examination of your “Street in the City” photo (and perhaps your book version is best for this) shows that the building in the background has some text on its frontage, just beyond being legible. It’s intriguing to think that the solution to this enigma is almost with eye’s reach if I may mix my metaphors. I have manipulated the online pic in Photoshop and although this reveals some details of the surrounds (the background building appears to be 4 – 5 storeys tall with eaves and a pitched roof, the pavement leading towards the background building is recessed to allow what we would now call a parking bay, the far street beyond the background building appears to pass at an angle, not at 90 degrees ) it’s still not enough. I have a feeling that someone somewhere has already trodden your path. Perhaps you could present the problem to the London Historians (a web search finds them) for their examination and to give you further leads. I’ll let go of it here. I wish you good luck and enjoyable researches! is Black Raven Alley, look closely at the bollard and face of the building, there appears to be a close match. The only thing I am struggling with is the large building around the corner. Tha Anchir is temptingly close, there is another photo with a horse and cart taken in the early 50’s that shows both bollards leaning in. However the building itself just does not line up. I have sent a contact to the London Historians and like you are trying Photoshop with a photo of the original, but no luck so far. Part of the name looks like a fluer de lis but is just not distinct enough.